In 2005, director Tom Shadyac (behind films such as Liar Liar, Patch Adams, Bruce Almighty), handed Roko Belic a New York Times article entitled, “A New Measure of Well‐Being From a Happy Little Kingdom.” The article ranked the United States 23rd on its list of happiest countries (last year it ranked 18) Shadyac, himself dissatisfied with his luxurious Beverly Hills lifestyle, asked Belic to make a documentary, investigating the origins of human happiness‐and why the U.S. the worlds most developed and economically successful country ranks so low. This simple inquiry led to a global exploration of happiness research and to Happy. How do we balance the allure of money, fame and social status with our needs for strong relationships, health and personal fulfilment ? Through remarkable human stories and cutting‐edge science,Happy leads us toward a deeper understanding of why and how we can pursue more fulfilling, healthier and happier lives. The film takes on a journey across the world from Louisiana to the deserts of Namibia, from the beaches of Brazil to the mountains of Bhutan. We hear the wisdom of a Kolkata rickshaw driver, the compassion of a volunteer at Mother Teresa’s Home for the Dying and the knowledge of some of the world’s leading happiness researchers. We witness a deeply moving scene where middle school students applaud the bravery of their classmates during a presentation on bullying. 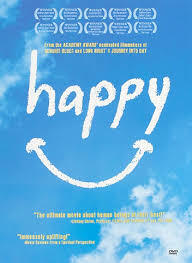 Happy combines real‐life human drama and cutting‐edge science to provide insights into the mysteries of happiness. As one of the Psychologist explains ‘If there was a link between economics and happiness we would see it directly…we are now living in more prosperity but happiness levels have not increased to the same level”. He goes on to explain that when money buys you out of the burdens of homelessness & gets you a meal it matters, there’s a bigger difference between happiness levels between those earning $5,000 and $50,000 but not between $50,000 and $50,000,000! Once your immediate needs are taken care of – food, shelter, warmth, safety etc there is no longer a correlation between how much you earn and how happy you are. We hear from the small country of Bhutan who are taking happiness levels very seriously. They say ‘in the pursuit of economic development nations are losing their identity and culture’. Bhutan is trying to work out what makes their people happy & leads to contentment and focus on that. Play: people who experience physical aerobic exercise are happier. Take part in fun activities. Do something creative – painting, dancing, making things. Flow: engaging in a fully absorbing hobby makes people happier. Being in the flow state is sometimes described as being ‘in the zone’, leads to losing track of time, when nothing else matters and that makes people happy. Flow can happen anywhere – dancing, personal family time, at work. People who experience flow on a regular basis are happier. Meditation focussing on compassion. People who count their blessings regularly, at least once a week are happier. Expressing gratitude for what you have amplifies those feelings. The documentary shows that people who are happy are healthier and live longer and whilst the formula for happiness is not the same for everyone, research shows that almost everyone can become happier by incorporating some of the points. It really is impossible to watch the documentary and not feel happier watching the stories – it’s a must watch!